The Windmill Inn in Foulby. Foulby is a village in the county of West Yorkshire, England. 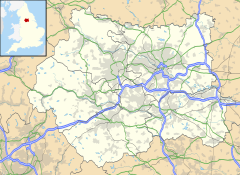 It is situated near Nostell, between Crofton and Ackworth Moor Top, on the A638 east-south east of the city of Wakefield. The village falls within the Ackworth, North Elmsall and Upton ward of Wakefield City Council. John Harrison (24 March 1693 – 24 March 1776) was an English carpenter and clock designer, who solved the problem of calculating longitude through the carrying of precise time on board ship, was born in this tiny village. There is a blue plaque on the house where he was born beside the main Wakefield to Doncaster road. Windmill Inn the site of a former windmill designed by John Smeaton in 1786. This is now an Indian restaurant called Arkaan's. ^ Ordnance Survey: Landranger map sheet 110 Sheffield & Huddersfield (Glossop & Holmfirth) (Map). Ordnance Survey. 2012. ISBN 9780319231876. ^ "Ordnance Survey: 1:50,000 Scale Gazetteer" (csv (download)). www.ordnancesurvey.co.uk. Ordnance Survey. 1 January 2016. Retrieved 18 February 2016. This page was last edited on 18 September 2018, at 15:55 (UTC).